Please fill in the missing form fields below. Why book with Dollar Car Rental? Welcome to Dollar Car Rental. Find the right rental car at the right rate. 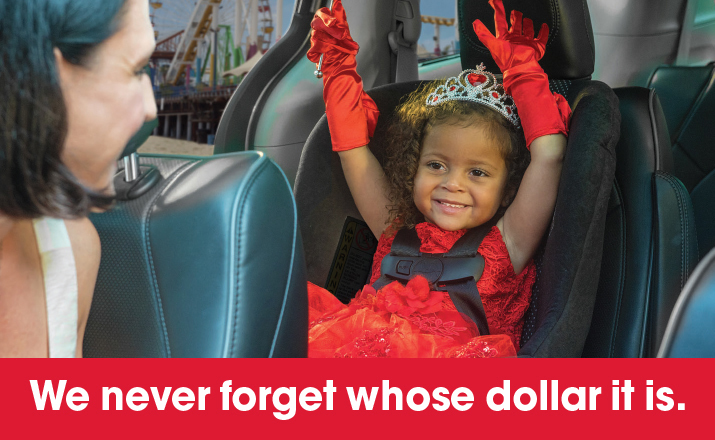 When it comes to rental car selection, Dollar’s got everything from Compacts to SUVs. Find a rental car for every occasion - minivans for vacations, SUVs for weekend getaways and economy models for saving a little extra spending money. You can get a car rental from Dollar no matter where you are traveling, be it around the block or around the world. We have a wide variety of locations in-terminal at airports and in neighbourhoods across Canada and the USA. Whatever your travel plans, you’ll need a rental car that’s up to the job. Our global locations offer a selection of cars to suit a wide range of needs, from compact cars for city run-arounds to family friendly sedans and minivans. If you’re planning on travelling solo or with family, colleagues or friends, choose from our fleet of cars to ensure you drive in style, with a wide variety of extras to choose from for added comfort. Amending your booking couldn’t be simpler either, so if your plans change just get in touch. Start planning your adventure now. Simply enter your location above and discover our great range of options.